Tapes cost $250.00 for the full set, although conference attendees may purchase a set for $100.00. Prices include ground shipping and handling. Please send your checks or money orders in U.S. Funds to: PC Support & Services, 3650 N Suncrest Lane, Appleton, WI 54914. 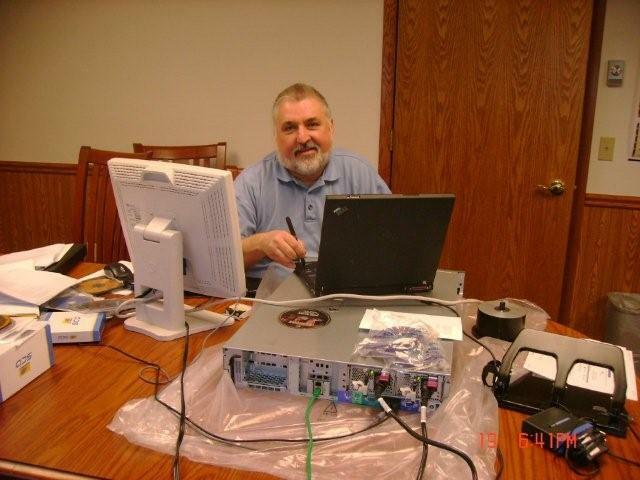 Here’s a photo of me working hard, installing SCO OpenServer 6 on a new HP rack-mount server. Actually, OpenServer 6 is a lot easier to install and administer than were previous versions of OpenServer, Unix and Xenix. As a computer consultant, I specialize in working with the Unix and Linux operating systems, and am an authorized SCO Openserver dealer: Welcome to SCO! Although I’m not a practicing accountant, I am an authorized Cougar Mountain Accounting Software dealer, and I have experience installing and maintaining several other computerized accounting systems, such as Open Systems(OSAS), Quickbooks, Great Plains and Realworld.